Craig Heath of BounceBack Ministries has been helping people open their hearts to God for over twenty years. In his first day-to-day monthly devotional and journal for men, God’s Plan For You, he shows us in a very personal way how the Scripture is relevant to our lives; he teaches us to listen to our own hearts every day and to reflect, not only on our relationship with God, but on how he shows his love for us through our own experiences. Each day gives us a brief passage from the Bible, and we are guided to make the connection to our own lives and to record our immediate reactions and inspirations. BounceBack Devotional and Journal is not simply an inspirational book. It’s a trusted friend that will guide you through your heartaches, restore your spirit, and sit quietly while you respond with your thoughts, feelings, and prayers. This daily devotional has been lovingly crafted through the author’s own spiritual insights in the hopes that the reader will both learn to understand that God has a permanent place in his life, and be reminded of the depth of God’s love. Anyone who may have lost sight of their path—or anyone who simply wants to strengthen their relationship with God—will take comfort in these pages. BounceBack Devotional and Journal was literally dropped into the author's spirit by the Lord on a night in 2003 at 1:00 AM. The Title, Book Names and even some of the daily devotional titles were poured out in that fateful hour. For the next four-and-a-half years, the author dedicated his time, money and experiences to writing the devotional, which is acuatually a 12-month series with over 360 daily devotionals. The essence of what has been written is a marvel given how the Lord used the author's experiences to relive and relate life experiences to demonstrate the power of Christ in the lives of men. 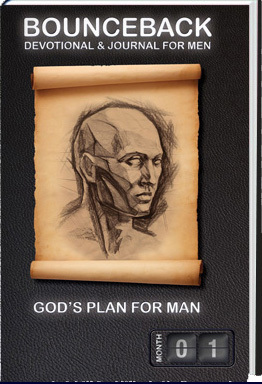 It all begins with this first devotional, God's Plan for Man, Month 1. Read, grow and enjoy. God be praised!